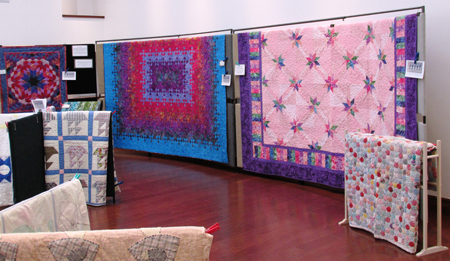 The 15th Annual Artesia Quilters Guild exhibit is currently on display at the Artesia Historical Museum and Art Center now through Oct. 1 during regular museum hours: 9 a.m. – noon and 1-5 p.m. Tuesdays through Fridays and 1-5 p.m. Saturdays. Large groups are encouraged to call ahead, and we can accommodate after-hours tours by appointment, as well. As always, this year’s show features all-new, never-before-exhibited works created by Guild members. Artesia Quilters Guild members have a reputation for creating unusual works — even traditional patterns and designs are given a fresh twist through nontraditional fabrics and techniques. This year’s exhibit features several Guild group projects done over the past year, such as mini month-of-the-year blocks, notebook/calendar covers, sewing kit carriers, purses, and double-oven mitts that protect your forearms as well as your hands. Guild members created jelly roll and mystery quilts as class projects this past year, as well. Jelly roll quilts are made from long, narrow strips sewn together. Mystery quilts are just what the name implies: Quilters are given guidelines for fabric choices and complete their quilts one step at a time — no one knows what the final quilt will look like until it’s finished! In addition to the Quilters Guild’s latest and greatest, the museum is displaying a selection of vintage quilts from our collection. We have signature quilts, Sunbonnet Sue quilts, and some very old ones on display — there’s a Tulip quilt that dates from the 1780s. We hope you’ll all have a chance to view this year’s show while it’s on display. See you soon!